I had a lot of fun with Cathy Zielske's die cutting lesson, a nice break from inking practice in the previous lessons (which I haven't finished yet; going backwards). 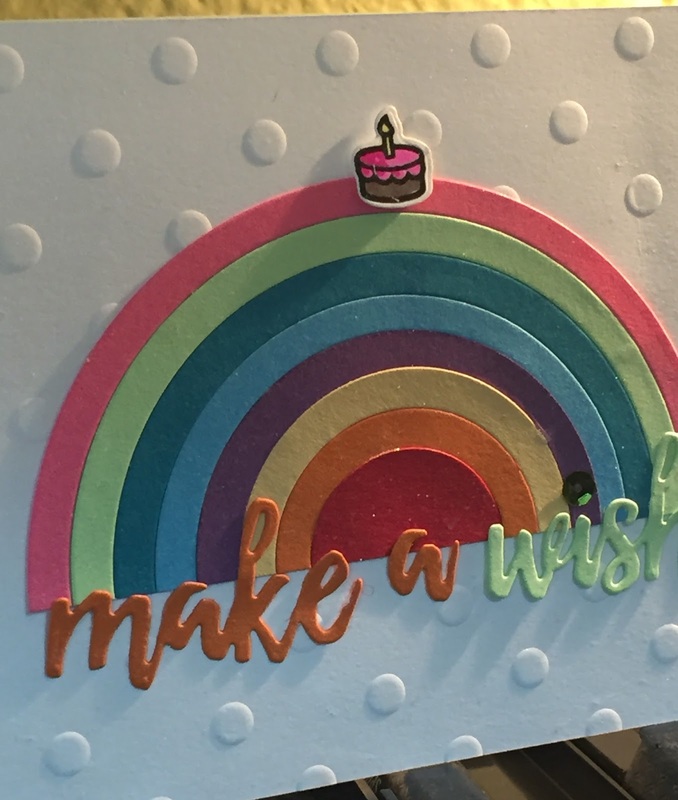 Since I have a set of eight circle Framelit dies from Sizzix, I used those to make eight sets of circles in eight different colors. Then, I challenged myself to make eight rainbow circles, each one using all the colors. Sounds easy, doesn't it? Believe me, it was kind of like math, i.e., not readily apparent to me. After several tries I figured out a system of alternating colors that was so simple I can't think of an excuse for not knowing how to do it in the first place. But, hey, I finished four birthday cards fairly quickly. A big help was using Stick-It sheets to keep the rings in place.